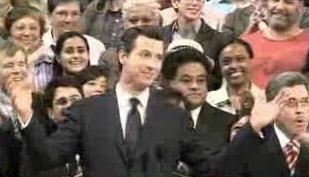 Newsom was present at the meeting, see: this SF Chron coverage. Also, re: your earlier post about the student regent vote he vote was unanimous with Blum abstaining- so it looks like he did not duck it. I didn't see him in the video for the meeting but it is hard to see everyone if they don't actually speak. And they don't vote by name in most cases. He might have attended later (or he might have been there). In any case, I will adjust the text. right, -he might have sat out the vote or not.ucop should provide a roll call sheet on votes, but…he came into the room talked to Lansing for a long while sat next to Yudof for a while – but during the vote was not paying attention to him.